Thank you recent Serpents Underfoot purchasers! Should have the paperback version out in a week or two! Proof copies are due to arrive any day now. Already have several requests for autographed copies! I plan to shortly have a link on this site to order autographed copies. By the way, If you do read my book and enjoy it … Please take a few minutes to review my book on Amazon.com. I would really appreciate that. I have set an initial goal of achieving 50 positive ratings. In addition, my book should be soon listed on Goodreads. I am working on that now. 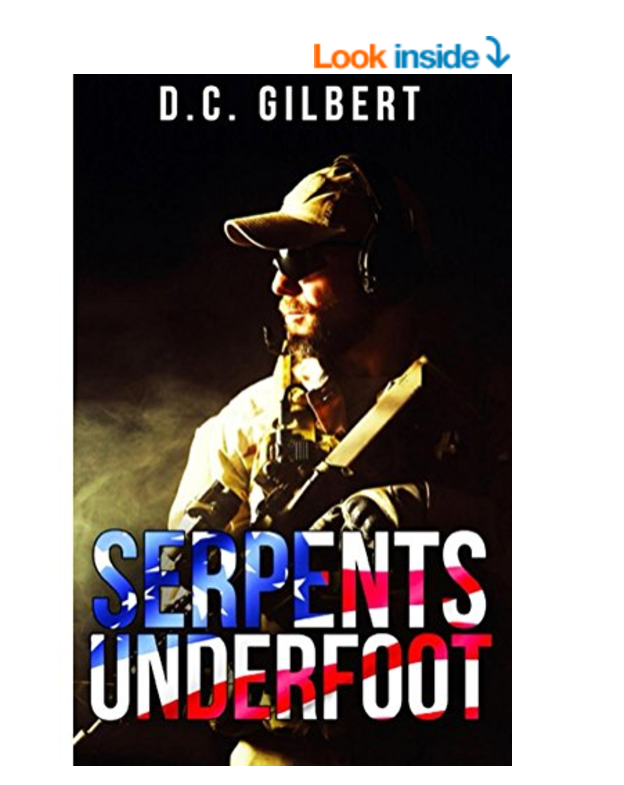 Serpents Underfoot by D.C. Gilbert – Now Available! Ladies and Gentleman! Serpents Underfoot Kindle Edition, is now available on Amazon.com. What a momentous occasion! I am now officially a published author! Needless to say, this is very exciting for me! I worked very hard on this book over the last few years and think I did a pretty good job. So, I hope some of you Kindle users will take a chance and buy my book. I think it is a good read … good blend of adventure, excitement, combat, intrigue and romance! That’s right folks! For less than the cost of a cup of coffee at Starbucks, you can help an aspiring author launch a successful career! My German Shepherd, Sophie, would be appreciative as well because it will help keep her in dog biscuits! Paperback / Hardcover Coming Soon! The paperback version should be available in a couple of weeks and the hardcover edition shortly thereafter. For anyone interested in obtaining an autographed copy (just in case I become famous someday), you will shortly be able to order one in hardcover or paperback through this website. Be on the lookout! I will be traveling as my schedule allows to do book signings and other events. Also, if you read my book on Kindle, or buy a paperback or hardcover copy, and enjoy it, which I am sure you will … please remember to stop by Amazon,com and give my book a review! I’d greatly appreciate it! Hello! I am DC Gilbert. I have been editing my book, Serpents Underfoot, for weeks. I think my eyes are ready to go on strike. Finally, late last night I uploaded the interior PDF and the cover PDF at CreateSpace! I have gone through their review process and now await their review process to complete. It is exciting! I am sure that when I get a copy in my hands, I will find some typo I missed. It will jump off the page and hit me squarely between the eyes. But maybe not … I guess if that happens, I will just fix it and move on … a revised edition. After all, Serpents Underfoot is my first novel! I am sure there will be some newbie mistakes. JD Cordell’s family paid in blood to make this country what it is … a land of the Free and the home of the Brave! JD’s family fought in every conflict that the United States has been involved in going back as far as the French and Indian War. This includes JD’s father, Curtis Cordell, who fought in Vietnam, Curtis married the beautiful South Vietnamese woman who nursed him back to health in a Montagnard village while his was MIA deep in the jungles of Vietnam. JD grew up believing that honor, loyalty, devotion to duty, and compassion are part of being a man. This was reinforced with his years of training in Isshin-ryu Karate and Vovinam, a Vietnamese martial art, from his years of martial arts training. All this molded JD into the man he is and the accomplished Navy SEAL he has become. While on a mission in Afghanistan, JD’s SEAL team unexpectedly discover a deadly terrorist plot being orchestrated by a radical mastermind living in Iran, which if successful, could spell disaster for the United States. Receiving a message from an old school friend who now works for the CIA, JD finds himself suddenly catapulted into the center of this sinister plot. When terrorists kill his friend, JD jumps feet first right into the action. In addition to working to avenge his friend’s death, JD uncovers a trail of treachery and betrayal that reaches from the mountains of Iran to the highest levels of the U.S. Government. What can JD do prevent a major terrorist strike which has the potential to destroy the entire American way of life? Read the book to find out … but, JD’s honor will not allow him to simply walk away. I hope you will give my book a read. It will be available very soon now. And, if you like it … please give me a good review on Amazon.com.